Coffee is the lifeblood for many Americans. It is not uncommon to hear people say they can’t start the day without that first cup of joe. However much like beer, a unique culture around coffee is growing across America. Take Starbucks for example, there’s one on every corner, but today’s coffee snobs spurn the global icon in favor of flat whites and Costa Rican pourover coffee. But not all cities are as coffee-obsessed as others. We looked through the data to see which American cities are the best for coffee fanatics. This is SmartAsset’s second annual study of the best cities for coffee fanatics. Read the 2016 version here. 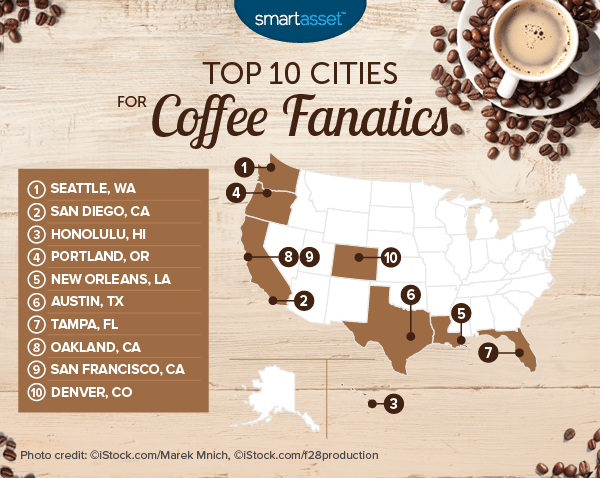 To find the best cities for coffee fanatics, SmartAsset looked at data on the 100 largest cities across six metrics. Specifically we looked at data on the number of coffee places, the number of coffee places per 100,000 residents, the number of coffee roasters, the price of coffee, the amount of coffee enthusiasm in a city as measured by Google search volume and the percentage of coffee places that are highly rated. Read more about where we got our data and how we put it together to create our final index in the data and methodology section below. Still Seattle – For the second year in a row, Seattle ranks first, which is exactly where you would expect it to rank. It should be noted however that Seattle didn’t just finish first, it dominated the rankings beating second-place San Diego by seven points on our index and third-place Honolulu by 15 points. California coffee culture – California is represented by three different cities in our top 10 – San Francisco, San Diego and Oakland. No other state has more than one entry in our top 10. Unsurprisingly, the birthplace of Starbucks, Caffe Vita, Seattle’s Best Coffee and Tully’s Coffee is ranked as the best city for coffee fanatics. Try as you might it’s tough to see what a coffee fanatic would not love about Seattle. It ranks highly in every single one of our metrics except price. In terms of availability, Seattle has the third-most coffee places per capita in our study and in terms of quality, 31% of its coffee places were rated a minimum of 4.5 stars by Yelp users. San Diego ranks as the second-best city for coffee fanatics. Last year, it took the sixth spot in our list. Few cities were able to beat San Diego coffee spots in terms of quality. Data from Yelp shows that 37% of coffee places in San Diego score above 4.5 stars. Coffee fanatics visiting San Diego may want to check out Holsem Coffee or Bean Bar. If you are a java lover in Honolulu, you aren’t alone. Google searches for “coffee” in Hawaii’s capital are 84% higher than the national average. For coffee fanatics looked to discuss their fanaticism over a cup of coffee, opportunities will be plentiful. Honolulu has the fifth-most coffee places per 100,000 residents at 243. Portland ranks fourth in this year’s study, down one spot from last year. If you are a coffee tourist, Portland may be the best city to explore first. It has the highest percentage of highly rated coffee places in the country. Portland is also the hometown of famed roaster Stumptown Coffee Roasters, as well as 12 other roasters, a good sign for people who love their coffee super fresh. Moving to Portland? Here are 15 things you should know. For coffee fanatics looking for something different, head to New Orleans. The local custom here is to mix chicory in with the coffee to create a unique flavor and experience. Why this is done is a bit of a long story, but if you are in town be sure to give it a try. New Orleans also has seven roasters local to the city so getting the freshest, most flavorful coffee beans should be no trouble. Folks in Austin have an abundance of options when it comes to great coffee. Over 33% of coffee places here are rated 4.5 stars or above. Vintage Heart Coffee may be the best among a great bunch, with Yelp users claiming it serves the best cold brew in Austin. A good cold brew is a must in a place like Austin, which can get pretty steamy in the summer. Tampa is a newcomer to this year’s top 10 best cities for coffee fanatics. Coffee drinkers in Tampa have access to great and also cheap coffee. 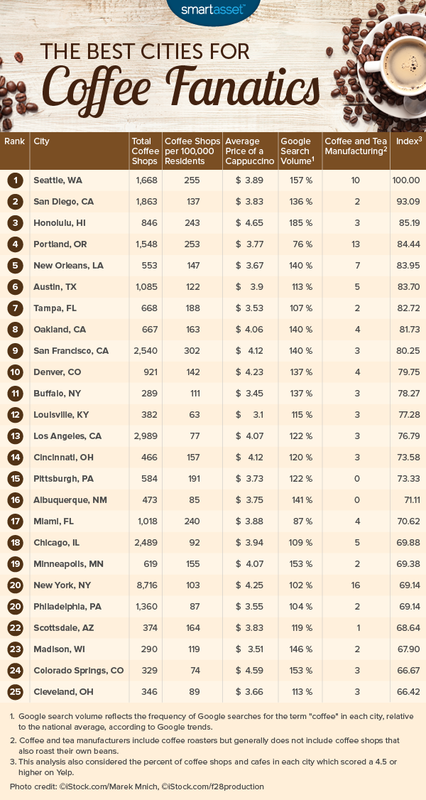 Tampa has the lowest average cost of a cappuccino in our top 10 at $3.53. Plus 33% of its coffee places are rated 4.5 stars or higher. The one concern may be the lack of variety, as there are relatively fewer coffee places in Tampa as compared to the other cities in our top 10. Oakland comes in one spot above its Bay Area neighbor to claim eighth place. Oakland is the birthplace of notable coffee spots like Blue Bottle Coffee and Oakland Coffee Works (founded by members of the band Green Day). Oakland also has some of the most enthusiastic coffee lovers in the country. Oakland residents Google “coffee” 39% more than the U.S. average. San Francisco is steeped in coffee history. It is the birthplace of world-famous brands like Folgers and MJB. Coffee culture in San Francisco, despite its long history, has also kept up with modern trends. There are more coffee shops and cafés per residents in San Francisco than any other city in the country at 302 per 100,000 residents. Denver fell two spots this year to round out the top 10 best cities for coffee lovers. The Mile High City has four local roasters, which is more than many cities in the country. Plus, it has top 20 scores in both total number of coffee shops and cafes, and coffee shops and cafes per 100,000 residents. Total number of coffee shops, coffeehouses and cafés. Data comes from Yelp. Coffee shops, coffeehouses and cafes per 100,000 residents. Data on number of coffee establishments comes from Yelp. Population data comes from the U.S. Census Bureau’s 2015 5-Year American Community Survey. Percentage of highly rated coffee shops. This is the percentage of coffee shops which are rated 4.5 stars or higher on Yelp. Average price of a cappuccino. Data comes from Numbeo. Google search traffic for coffee as a percent of national average. This is how many times residents in an area searched for the term “coffee” in the past year as compared to the national average for that search term. Data comes from Google. Total number of coffee and tea manufacturers. Data comes from the Census Bureau’s 2014 Business Patterns Survey. We ranked the 100 cities by each of the six metrics. We then averaged those rankings giving equal weight to each factor. We assigned a score to each city based on the averages. The city with the best average received a score of 100 and the city with the worst average received a score of 0.